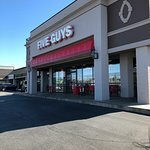 Five Guys, including this one has some of the most flavorful burgers you can experience, and amazingly any and all toppings are included in the burger price. Yes, the burger price is a little higher but the taste is worth it when you consider the amount of toppings you can add. I really like the grilled onions and mushrooms and usually get mine fully loaded. Their fries are also some of the best as they are fried in peanut oil. I always get the bacon burger while my wife gets the little burger...mine has two meat patties in it! Delicious to say the least. The wait is short, usually a minute or less...as they always have about four crew working the preparation. The restaurant has always been clean. Five guys are pretty consistent but this one has great customer service from all team members. From manager to cooks in the back, smiles on faces and greeting us with manners. The place is very good as far as a burger joint. The Cagin Fries are wonderful and a small order will feed two easily! Burgers are fresh and done well!! Pricey for a burger. It was very good though. Had peanuts if you like them. It has highchairs. No smoking inside. We prob won't go back we can go to chillies or somewhere for that $$$$. Been to Five Guys Burgers & Fries? Share your experiences!